EA exec Peter Moore thinks when all the chits are counted, BF3 will have stolen some of Activision's customers. The shooter "feud" between EA and Activision has been well-documented. Activision's Call of Duty has been the undisputed heavyweight champion, breaking sales records three consecutive years, and Electronic Arts was hoping that one or more if its shooters would steal a few customers. Battlefield 3 did better than Medal of Honor did the year before, selling through 10 million copies to stores since its release in October according to EA's Peter Moore. That number pales compared to the only stats released by Activision on MW3 - 6.5 million sold in one day, $775 million gross in the first five days - but Moore still believes that Battlefield grabbed a piece of Activision's audience. "I think when the dust fully settles, maybe when we're looking at this at the end of our fiscal year [March 31, 2012] we'll do an analysis and I think we will have taken share," Moore told Industrygamers.com. 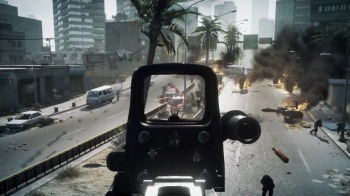 "I don't think there's any doubt about that, unless everything BF3 sells is just incremental." Moore then framed the whole competitiveness between EA and Activision in the shooter genre as a win for the entire business. "Two entities have benefited from Call of Duty and Battlefield being on the market: gamers and the industry, retailers and people who rely on the ability to sell big blockbuster games. Together we've grown the genre enormously." If BF3 didn't grab customers from MW3, then we suddenly have a whole lot more shooter fans out there. "10 million sold in and 5 million sold through doesn't come out of nowhere - if we haven't gained share, that means in the first week we've added 5 million new FPS gamers," Moore said. "Yes, many of them bought both games, undoubtedly. Have our retail partners enjoyed this? Absolutely. And does this help push the game industry to the front pages of newspapers? You bet it does. Go look at USA Today, go look at The New York Times - the big entertainment blockbusters this year are not movies, they're videogames. Call of Duty and Battlefield have done that." I'm not sure how much Battlefield has to do with all the reports I see in mainstream media - most of those feature MW3 - but I commend Peter Moore for excellently attempting to drink Activision's milkshake.